Visit Great Dixter’s website at www.greatdixter.co.uk. Christopher Lloyd’s book, “The Well-Tempered Garden,” gives a lot of insight into Lloyd’s views on gardening. An excellent, multiple-part program about Christopher Lloyd and Great Dixter, entitled “Gardener Provocateur,” can be viewed at youtube.com/watch?v=GByDqI8n_w4. There is something very special about seeing a garden in person after decades of reading about it in books and magazines. Such was the case with my visit to Great Dixter last month. I recently led a group to tour some of the finest gardens in England. Over the course of 11 days, we visited Sissinghurst Castle Garden, Hidcote, Kew Gardens and Waterperry Gardens, just to name a few. As much as I enjoyed all of the other gardens, it was Great Dixter that had an emotional impact on me. Maybe it was just the fact that I was finally standing in front of that iconic house and exuberant garden. To clarify, Great Dixter is both a house and a garden. Located in Northiam, East Sussex, the house is actually a blend of three houses, with the original being a mid-15th-century timbered building. In 1910, a 16th-century house was moved to the site and, in 1912, additional construction finally married the two homes. 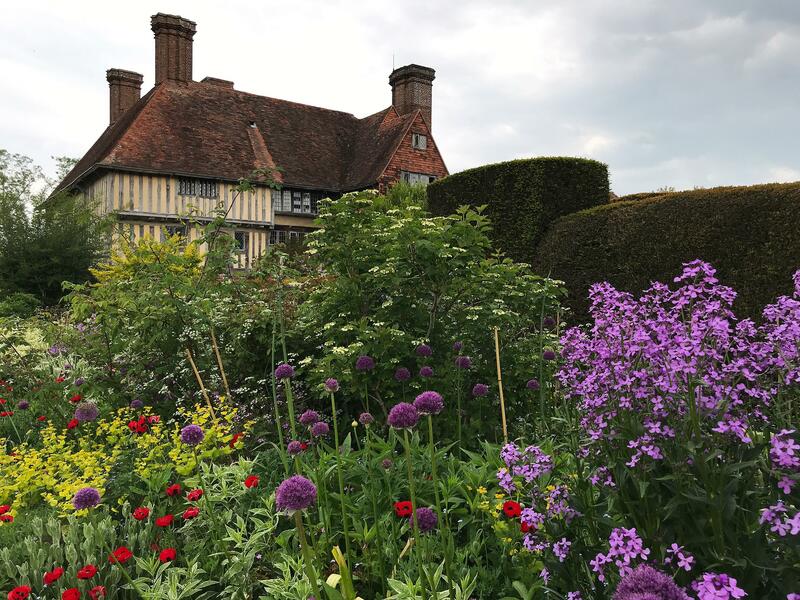 Many gardeners have heard of Great Dixter because of its most famous resident, Christopher Lloyd. His father purchased the house in 1910. Christopher was the youngest of six children. He and his mother, Daisy, both shared a lifelong passion for gardening. Christopher Lloyd lived from 1921 to 2006 and spent the majority of his life at Great Dixter. He was well-known as a writer but was often considered to be very controversial, especially with his landscape design techniques that involved combinations of diverse colors in his flower beds. After a private tour of the house, our tour group was turned loose to explore the gardens. They completely lived up to my expectations. The gardens, which are concentrated around the house, include a sunken garden, walled garden, topiary lawn, long border, an exotic garden and a vegetable garden. Wandering through all of these areas was an adventure because one never knew what would be around the corner or through an opening in the many clipped yew hedges. I almost wanted to run with abandon from one area to the next because I felt giddy about being at Great Dixter. Fortunately, my desire to savor every square inch led to a very memorable visit. My tour group and I fell in love with the eye-popping red Ladybird poppies gracing many of the beds. Other fantastic flowers that I’m certain have been added to our future shopping lists include Purple Sensation alliums, bicolor lupines, dame’s rocket (Hesperis matronalis), hardy Jerusalem sage (Phlomis russeliana), single white tree peonies, and meadow rue (Thalictrum). In addition to a wonderful shop for purchasing garden-related items to bring back home, there was also a nursery filled with a mix of familiar plants and many plant cultivars I’d never seen before. Each of us is to be commended for resisting the temptation of trying to sneak plants back home – something the U.S. Customs officers would most definitely frown upon. All in all, our visit to Great Dixter brought the garden alive for those of us who had only heard of it before. It is a must-see garden for any English gardens tour itinerary. Susan Mulvihill is co-author, with Pat Munts, of “Northwest Gardener’s Handbook.” Contact her at Susan@susansinthegarden.com. Watch this week’s “Everyone Can Grow A Garden” video youtube.com/c/susansinthegarden. Published: June 23, 2018, 1 p.m.